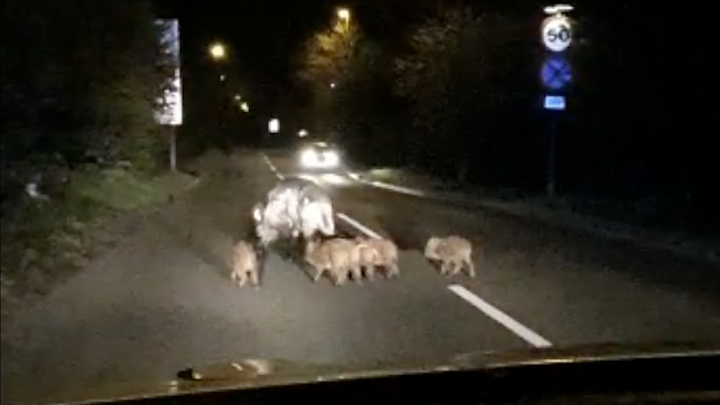 A family of pigs caused long loins of traffic when they hogged a main road. Police went to the scene in Heath Hayes, Cannock, and closed the road while they set about crackling the case. But before officers could grill any suspects, the pigs returned to a field. Ch Insp Sam Rollinson said: "It's not something you deal with every day." "If they hadn't gone into field, how we would have corralled them would have been interesting one," he said. Special Ch Insp Rollinson said officers had been working in nearby Norton Canes when they received a number of calls reporting the problematic porkers. Hednesford Road, near Five Ways Island, was completely blocked when they arrived, he said. "Because of the time, it was people who had finished work late, shift changes, people were trying to go around them and I think they were quite frightened," he said. "Once the road was closed, and they realised there was no traffic, they decided to turn snout and head off the road, under a gate and into a field. "It looked like they knew where they were going and it was a short-lived bid for freedom. "There were a few cheers from the public once the road was cleared."